bsntech, Author at Greenworks Painting, Inc.
Greenworks Painting, Inc | Professional Interior Chicago Painters! February 25, 2015 / bsntech / Comments Off on Greenworks Painting, Inc | Professional Interior Chicago Painters! Professional Interior Chicago Painters | Greenworks Painting, Inc. Nothing freshens up your home like a new paint job. You don’t have to go through a huge renovation process to give your home that fresh new look. The professional Chicago painters at Greenworks Painting, Inc. can help you rejuvenate your home and provide you with a fresh new paint job. Not only does your new interior painting make it more beautiful, but it can also increase the value and appeal when it comes time to sell. Painting can seem like a fairly simple process but when it really comes down to it, there is a lot of potential for problems, miscommunications, and other challenges. We have heard nightmare stories from clients that have had to deal with other Chicago painting contractors who have become their own personal nightmares. At Greenworks Painting, Inc. we pride ourselves in our ability to provide customer satisfaction through superior results, professional service, and fair prices. Painting the interior of your home is a relatively minor renovation that yields immediate results. Contact Greenworks Painting, Inc. and your space can suddenly have a brand new look! Call Greenworks Painting, Inc. today for a FREE ESTIMATE at 773-267-9111 or click below. If you’re looking for a solution to your wrought iron painting, then look no further than Greenworks Painting, Inc.! 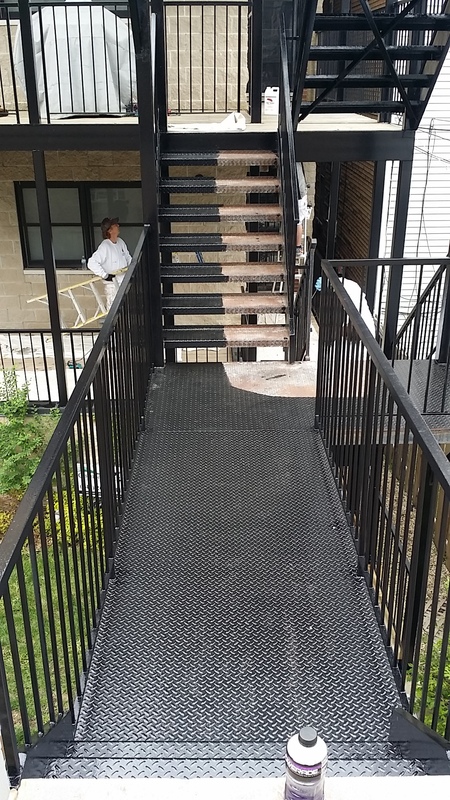 When dealing with the aggressive weather conditions in Chicago you might find that your exterior metal structures just don’t look too nice after a couple of Winter/Summer seasons. The extreme cold weather during the winter months can cause quite a bit of damage, especially if you are using salt (a big no-no) on your porch, not to mention the weight of snow and ice just sitting on the flat surfaces. Our summer months are also quite damaging to exterior surfaces due to high U.V. exposure and heat. Call Greenworks Painting, Inc! We use an extensive preparation method which is sure to keep your wrought iron looking beautiful and rust free for many years to come. Our standard preparation includes hand and/or mechanical wire brushing, sanding (for adhesion purposes), and a pressure wash to remove surface dirt and dust. We then spot prime all previously rusted surfaces (and any bare metal surfaces). We use a combination of industrial grade paints (Sherwin Williams Corothane) which are so durable that they are used on highways and bridges, petro chemical applications, and marine use. One of the most important factors of keeping rust at bay is to maintain your metal structure annually. It is a lot cheaper to maintain your surfaces annually versus repainting every 3-5 years, not to mention costly metal repairs if neglected too long. It typically takes one of our painters a day to spot treat any developing rust and prolong the life of your paint for many years. If you’re concerned about rust damaging your wrought iron porch, balcony, fence then call Greenworks Painting, Inc. today for a Free Estimate! Chicago Painting Experts | Greenworks Painting, Inc.
September 17, 2012 / bsntech / Comments Off on Chicago Painting Experts | Greenworks Painting, Inc. Maintaining the exterior of your home in Chicago! Chicago can be one of the toughest areas on your exterior paint. From the 95+ degree summers to the sub-zero winter temps, it can definitely take a toll on your exterior paint. Have you ever wondered how often you should be maintaining or repainting the exterior of your home? It’s not unusual to run into a homeowner every now and then who says they haven’t painted their exterior for 20 years, why is that? You must be saying either that paint job is long over-do or what kind of paint did they use that lasted so long? And what exactly did they do, if anything, to maintain a beautiful appearance for so long? The truth is ANY paint job can last 20 years if the job is done right and then properly maintained! First on my list is proper preparation. Thorough cleaning, scraping, sanding, and spot priming are the basic essential keys to a log lasting paint job. It is extremely important that the surface is clean so that the fresh paint can adhere and bond properly. Painting over a dirty surface is a sure bet that you will have paint issues in the not so distant future. Second, you should always opt for a top quality paint such as Benjamin Moore or Sherwin Williams. It doesn’t make sense to skimp out on material since the majority of your cost is labor, so if you’re trying to save money on paint…you’re making a big mistake. Top quality paint has more titanium and resins which don’t fade as quickly and last much longer than cheaper paint. Two coats of quality paint should last you about 8-10 years but can last as long as 12-15 years or more if applied and maintained properly. After a new paint job it’s very important is to keep any surface contaminants such as dirt, mildew, or moss off of painted surfaces by pressure washing or hand cleaning as needed generally once every year or two. If you’re experiencing any peeling paint it’s best to repair and touch these areas up as soon as possible, the longer you allow troubled surfaces to exist it will create progressive damage, so it’s better to handle it right away! With just these few simple steps you can extend your paint life and make it last for many years! Make sure to call us, Chicago painting experts! Call Greenworks Painting, Inc. today for a FREE ESTIMATE! 773-267-9111 or click below. Repainting your commercial property is an important project, and it is a project that you don’t want to trust to just anyone. There are dozens of Chicago commercial painters servicing the local area, but you want to find a painting company that can provide you with superior, professional results and that can complete the job in an expedited time frame. When you need to find the best painters in the Chicago area for smaller or larger needs alike, Greenworks Painting is the company to call. At Greenworks Painting, we know that painting the interior or exterior of your business property can create a disruption in your business. You need to repaint your building, but you want to enjoy fast results. More than that, you want to enjoy high-quality results that create crisp edges and provide full coverage. Each of our craftsmen is a full-time professional with significant experience with both interior and exterior painting services. They can provide you with full coverage results, or you may request any number of faux finishes to take the look of your space to the next level. We can provide rag rolling, Venetian plaster and other finishes that can enhance the look of a retail, restaurant, office or other commercial space. Further, we only utilize eco-friendly paints and stains when possible. This ensures that the indoor air quality in your place of business remains safe and healthy for you, your employes and your customers or clients. Our dedicated team of Chicago commercial painters will provide you with great results. Each of our craftsman is a true professional who strives to provide you with the amazing results. Our hiring process is stringent, and each employee is pre-screened and his experience in the industry is verified. Some painters are known for extending the completion of a project outward or for being less than professional on the job. Our goal, however, is to provide you with fast, beautiful results in a manner that is least disruptive to your business operations. Greenworks Painting can provide you with a full range of commercial painting services. Whether your current painting needs are large or small in scope, we can handle the job. You can contact us today to schedule an on-site estimate, to learn more about the paints and stains we use and to explore how our services can help you to achieve the look you want in your space. Chicago Residential Painting | Eco-Friendly Paint! In most homes across the Chicago area, many surfaces are painted and stained to create a gorgeous, decorative look. These surfaces may include drywall, trim, stair railings and more. Over time, these surfaces can become outdated and worn out with appearance, and repainting or re-staining them is a necessity. This can be quite a chore to undertake on your own, and many homeowners struggle to create straight, clean edges or to apply paint and stain evenly through their efforts. At Greenworks Painting, we offer you a convenient and environmentally friendly solution for updating the look of your home. Greenworks Painting is a full-service Chicago residential painting company. We provide both interior and exterior painting services, making every effort to protect your furnishings and belongings while providing you with superior results. Before we begin, we will prepare the surfaces to be painted or stained. This may include repairing or patching drywall, replacing trim pieces on your home’s exterior that are in poor condition and more. In addition to painting walls, trim, siding and more, Greenworks Painting offers re-finishing services on cabinets, hand rails and other stained wood surfaces in your home. We utilize only the highest quality of paints and stains to ensure you enjoy long-lasting results from our efforts. There are many Chicago residential painting companies that you can call on for the services you need. Greenworks Painting, however, is one of the rare few companies in the area that has been serving residents for over twenty years. We utilize eco-friendly paints and stains when possible to ensure your home environment remains safe and healthy. Some paints and stains are known to decrease indoor air quality, and our eco-friendly solutions provide you with a healthy paint alternative that you can feel good about. Further, we are fully bonded, and we conduct a thorough background check on all of our skilled painters to ensure you enjoy the best results possible. If you have the desire to update the look of your home’s interior or exterior, using the services of the skilled craftsman at Greenworks Painting is the clear choice. We provide you with a convenient and environmentally way to update the look of your home and get the results you want. Whether you only want one surface in your home refinished or you want to repaint every room, we are the company that can provide you with the ideal results. Contact us today for an in-home estimate. © 2019 Greenworks Painting, Inc.